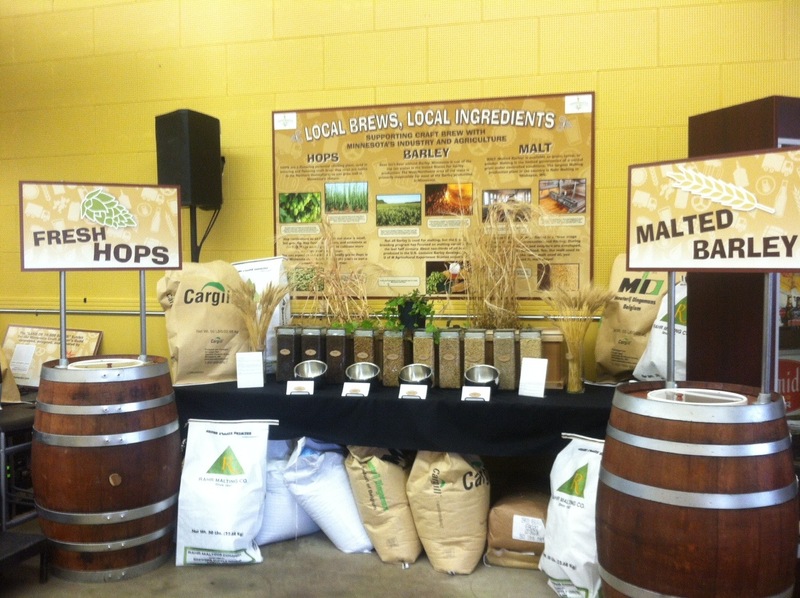 For the third straight year, the Minnesota Craft Brewers Guild is hosting the Land of 10,000 Beers exhibit in the Horticulture/Agriculture Building daily (Aug 21-Sep 1st) from 9 AM till 9 PM. The exhibit has been a huge hit over the past couple years which has been attributed to the educational nature of the hall and thirsty crowds of people. There will be four different flights available for purchase including Belgian, Hoppy, Dark, and Light with special cask releases on Fridays throughout the fair. There will be a stage in the exhibit hall where a host of different people from throughout the industry will speak about various topics such as distribution, brewery expansion, marketing, ingredients, contract brewing, and more. Check the schedule below. 3:00pm Member Profile: Behind the Beer, John Klick & Bob DeVernois of Excelsior Brewing Co.
6:00pm Barrel-Aged Beer and Cask Beer, Frank Kaszuba of Fitger’s Brewhouse and Matt Hall of Lift Bridge Brewing Co.
3:00pm Member Profile: Behind the Beer, Mark Stutrud of Summit Brewing Co.
6:00pm Member Profile: Behind the Beer, Franco Claseman and Bob Roepke of Flat Earth Brewing Co. and Jeff Moriarty of Tin Whiskers Brewing Co.
3:00pm Member Profile: Behind the Beer, Joe Pond of Olvalde Brewing and Jace Marti of August Schell Brewing Co.
6:00pm Family Business: A History of Beer, Ted and Jace Marti of August Schell Brewing Co.
3:00pm Member Profile: Behind the Beer, Spencer Anderson of Surly Brewing Co. and brewers from Dangerous Man Brewing Co.
12:00pm Member Profile: Behind the Beer, Duluth Beer City, Colin and Laura Mullen of Bent Paddle Brewing Co.
3:00pm Member Profile: Behind the Beer, Canned Beer 101, Tom Whisenand of Indeed Brewing Co. The Ballpark Cafe will once again be pouring craft beer from many of the local breweries including Lift Bridge, Lucid, Bauhaus, Indeed, Surly, Excelsior, Badger Hill, Steel Toe, Third Street, Summit, and Bent Paddle. Mini Donut Beer from Lift Bridge will again be available this year and the supply is much larger than it was last year. New to the fair this year is the Shell’s bar and stage at the West End Market. There you will be able to purchase the fair exclusive Grain Belt Blu which is a Blueberry Radler style beer (a gallon of blueberries per half barrel) and a fun twist on one of Minnesota’s most beloved brews. You will also be able to try one with frozen foam (called Frozen Blue) which is supposed to keep your beer colder longer. Oktoberfest with blueberry foam will also be available and will be called Black and Blu. One final note, Summit will be offering a fair exclusive brew called The Villian this year. This is a Black Lager brewed up by Gabe Smoley and it will only be available at their Summit on a Stick booth located in the International Bazaar. Stay tuned to my Twitter handle @lodgefather for the latest craft beer news from the fair.